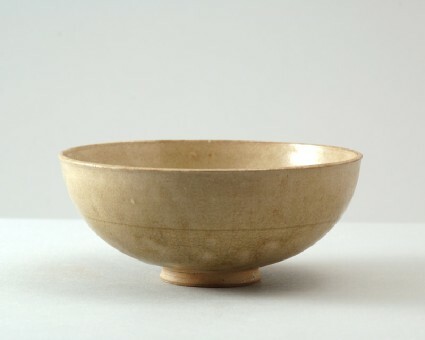 The globular bowl is supported on a narrow splayed, nearly solid foot with an incised groove in the concave base. The rim is very slightly flared. The inside is decorated with a large flower-head with six incised pointed petals around a circular centre stamped with seven rings. The outside is plain, with an accidental incised line running halfway round the bowl. The grey stoneware body bears a densely crackled, translucent olive-green glaze, which ends above the foot, leaving the foot, base and a small strip above in the biscuit.